The bathroom is a very important area of the house. It provides you with a private space to answer ‘nature’s call’ and to wash. Some people even consider it as a sacred place where they can relax and temporarily get away from everything that life throws at them. The history of bathrooms is not known by many. Did you know that during the ancient times, bathing the body was often used in religious or political ceremonies? To make it more interesting, the kind of bathroom you use reflects your status in the society. Back then, only the rich and those important in the society are given the privilege of using the most decent bathrooms (to their standards, at least). Fast forward to today, bathrooms have changed tremendously. What was once a small and plain-looking room, is now larger and packed with a lot of features. Aside from cleaning the bathroom, decorating it is also something that most people do. 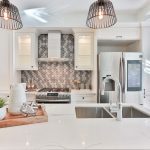 So if you’re thinking of sprucing it up but don’t know where and how to start, here are some ideas to consider for your next project. 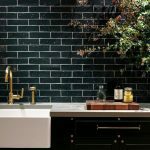 Even until now, tiles are still the clear winner as the most widely used material for decorating houses. They are made either of ceramic, porcelain, natural stone, or glass. They’re so common that you’d see tiles in almost all parts of the house. The way that you use tiles in your bathroom can make or break how it will appear. Get it wrong, and you’d have to redo everything. On the brighter side, there are a lot of tiling ideas for homes that you can adopt—including the ones for your bathroom. For instance, having the same colour of tiles for the bathroom wall and floor will help make space look bigger than it is. If you’re after that ‘luxury look’, put together a monochrome scheme using white fittings and black tiles. But if you find monochrome tiles boring, add a splash of coloured tiles to accentuate areas such as around mirrors. Tiles come in so many shapes, designs, and sizes, giving you lots of different ways to use them. Natural light is one thing that’s often taken for granted when in fact, you should maximise it to the fullest. 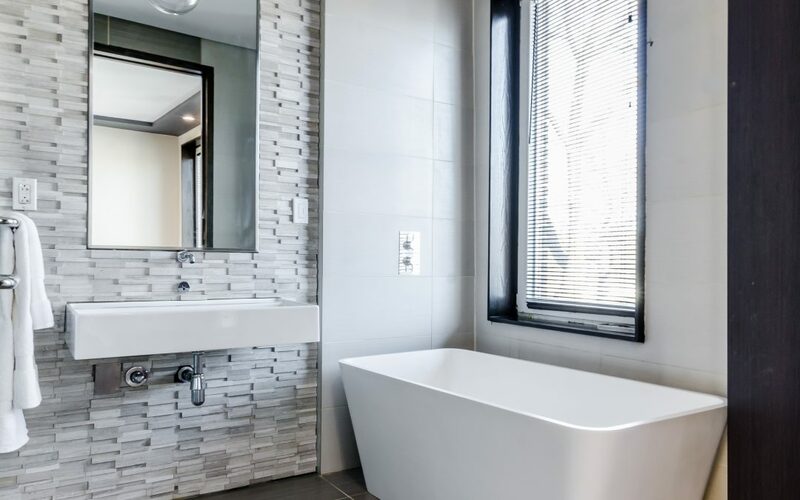 Allowing more natural light to enter your bathroom means less energy is used to light the room during the day, which can help lower your energy bills. Open up those windows and let the sunshine in. If you’re worried about privacy, consider installing decorative textured glass. It allows up to 84% light transmission while still maintaining a degree of privacy. A lick of white paint and strategically-placed mirrors will also help since they do an excellent job of reflecting light. Another good reason is all the benefits that natural light brings. The body’s natural clock, also known as circadian rhythm, needs to be reset on a daily basis to remain in-sync. Regular exposure to natural light is a key factor in this process. Sometimes, plain and simple becomes dull and uninteresting. If you’re the type who wants to explore and try out new things, why not give your bathroom a new lick of paint? Instead of the usual white, go for something darker and bolder. Blue, for instance, is cool and calming to the eyes which makes it perfect for when you’re in need of a ‘retreat’. If you fancy bringing in the greenery, green bathroom tiles or wallpapers are the way to go. Black is also a good option. It’s simple and yet, is associated with sophistication and modern looks. Regardless of which colour you choose, just remember that the key is being able to match it well with the surroundings. Speaking of wallpapers, these are also excellent to use to decorate your bathroom. The upfront costs of wallpaper is higher compared to paint. However, they can last for up to 15 years whereas paint can need a fresh layer after only a couple of years. Now, you’re probably wondering how it’s possible to use wallpaper when it’s no match for water and the humidity of a bathroom. But there are wallpapers made specifically for this purpose. They are covered with a film to protect them from water damage. More importantly, wallpapers come in so many different designs. There’s pretty much a wallpaper to match any idea you can think of for your bathroom. And in the rare event that you can’t find what you’re looking for, there are a lot of companies who specialise in personalised wallpapers. One of the ideas mentioned earlier was about using hues of green to decorate your bathroom. If you want to take things up a notch, literally bringing in the ‘greenery’ is an excellent choice. 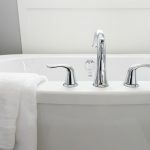 First you will want to do a bit of research as only certain types of plants will thrive in the humid, high tempurature conditions in your bathroom. Think about where you’ll place your plants. Next to the window is an ideal location for some species, while others prefer being out of direct sunlight. However, many bathrooms have very small windows, meaning that your plants may receive very little light to grow healthy. Make your choices based on the natural light available. If your bathroom has no windows, any real plants won’t survive without natural light. Instead, try using fake plants. They are much easier to look after! Among the best plants that are ideal for the bathroom are aloe vera, orchid, snake plant, peace lily, spider plant, and bamboo. Consider other indoor gardening plants and take care of succulents. Having any of these will help purify the air you breathe. 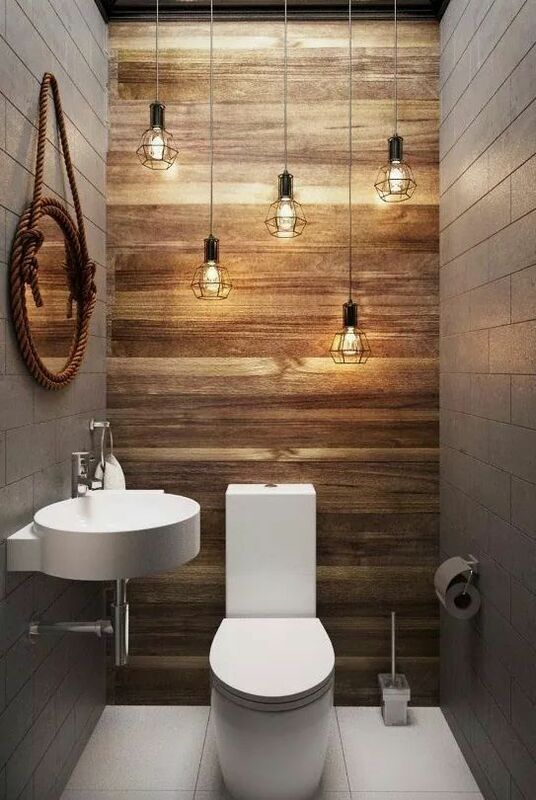 Lighting plays a big role not just in bathrooms, but in every part of the house be it indoors or outdoors. When it comes to your ‘sacred’ area, trending lights include hanging pendants and light bars that diffuse light in a room. While you can do this the DIY way, you need to be extra careful in doing so. Even the smallest of mistakes can lead to you getting electrocuted or worse, starting a fire. If in doubt, leave this job to a professional. Also, don’t forget to choose LED lighting fixtures. They are a lot more common these days and for good reasons too. Compared to traditional lighting they’re more energy-efficient and won’t heat up your bathroom. Decluttering the bathroom is free and one of the best ways to decorate. 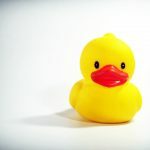 If you have lots of extra towels laying around, or bottles upon bottles of shower gels and shampoos, now is a good time to discard or store anything that isn’t regularly needed. You’d be surprised at how refreshing your space will look afterwards. If your bathroom has limited space, the best thing to do is maximise the existing storage that you have. Try adding some hooks underneath shelves, or stands to increase useable surface space. Other ways include installating floating shelves, wall-mounted baskets or adding a small under sink cabinet. If you have the luxury of space, evaluate how well your current storage is working for you. Could it be more efficent? Could you be making better use of your space? It could be time to rethink! Decorating your bathroom doesn’t need to be incredibly difficult, or massively time consuming. Sometimes the smallest changes can make the biggest difference. If you’re not ready to tackle some of the bigger options, start small and work up. It may be that all your bathroom really needs is a bit of a declutter to feel like a whole new space.